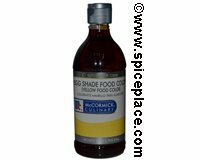 Use Egg Shade (Yellow) Food Coloring to tint desserts, candy, cakes, cookies, and frostings. For best results, as food color gradually until the desired hue is achieved. Ingredients in Egg Shade Color Color: Water, Propylene Glycol, FD&C Yellow 5, Propylparaben (as a preservative) and FD&C Red 40. Enhance color of cheese sauce, chicken or turkey gravy. Make a yellow rice by adding 1 tsp egg shade food color to 1 quart water/stock and 2 cups dry rice. Add 1 tsp Egg Shade food color to 1 gallon water or stock, and cook 1 pound of pasta. Easter Egg Dyeing: Add 1 tsp vinegar and 1 tsp yellow food color to 1/2 cup boiling water. Dip hard cooked eggs for 5 minutes or longer. Make a yellow glazed icing by combining 1/2 tsp yellow food color, 1/2 cup confectioners sugar and 3 tsp milk. Ingredients: Water, Propylene Glycol, FD&C Yellow 5, Propylparaben (As A Preservative) and FD&C Red 40.